Need ideas to create a heap of Christmas cards quickly? It’s nearly December – of course you do!! Here’s some ideas that our design team are hoping will get them out of some jams this Christmas season. Jane created these quick Christmas cards by stamping and clear embossing a tree on the front of the folded cards (smooth side) then she dragged an ink pad down the card over the image (use a sponge around the image if need). Clean over the image with a tissue, Jane then added glitter tape down the sides to create clean lines. She then stamp the sentiments with the same inks, cut them out and arrange them on the cards with a white ribbon bow. Simple triangle Christmas trees are one of the quickest and most effective ways of communicating Christmas on a card. Suz Doyle tends to go back to them every year – mostly because she loves them! This year she has layered patterned papers on Tim Holtz’s fabulous new mirrored cardstock to create these fun trees. Simple punches show off the mirror underneath, and raising the trees gives them a really pretty three dimensional look. Three sheets of patterned paper are all you need to create these gorgeous quick cards by Carole Janson. She has used the beautiful Webster Pages Royal Christmas range. The stunning Deck the Halls features 25 gorgeous unique windows and doors and she has used those as the feature to her cards. Carole also created a tag to match. Finally, Jennifer Maguire often makes cards that look like simplicity itself – and sometimes they are, but they are always beautiful! This breathtaking card can be made using a simple circle mask and your own choice of inks and stamps. 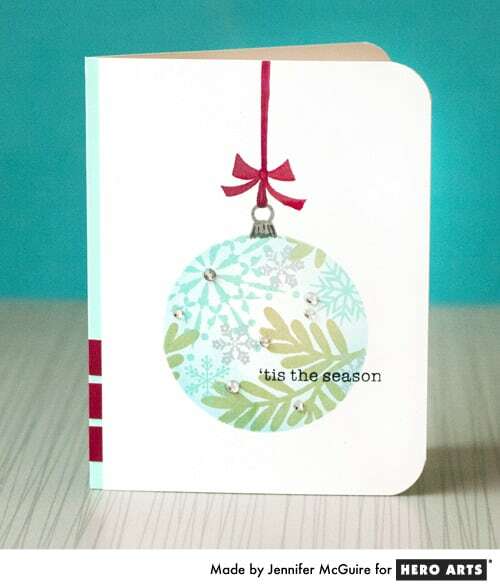 See how Jennifer has created this card here.